In Beyond Wings, Alison Lock doesn’t merely reveal her versions of the world, she walks us through them. Indeed, with each poem I read, I was conscious of her steps and via the immediacy of tone and image she employs, at times I felt I was accompanying her on her journeys. This is quite a feat to pull off for any poet, and, with one so adept at bringing landscapes and wildlife to life so vividly, it’s a joy to walk beside her. Lock is not afraid to experiment, with striking fixed forms and concrete poems popping up here and there in the collection. When she uses Japanese forms, it also allows the reader a glimpse of her prose style which is as equally rich in tone, touch and language. But what I find most enjoyable in ‘Beyond Wings’ is what Lock gets away with. The world is full of poems about herons for instance, and when Paul Farley compared one to a pissed off husband nagged to go to the garage to get his wife a pack of Superkings, I thought no poet would get so close to an original take on a heron ever again. But Lock just manages to get away with it with her sharp eye for detail: A hieroglyph/an ibis/poised. And who needs another poem about the murmuration of starlings? Even done well, the mere mention of starlings has many of us sighing with despondency because no matter how great the poet may be, they will rarely get close to the breathtaking beauty of witnessing a murmuration with your own eyes. But when we are left with the pathos of one that doesn’t take place, and pathos handled so deftly I might add, then we can only applaud the poem’s startling originality. Then there’s the old magpie one for joy two for sorrow routine (one I hate to admit has featured in a recent published poem of my own). A central idea of such banality should not work, but when handled with such skill, Lock makes it work, and then some. 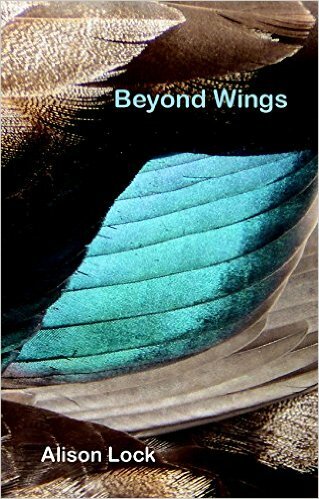 ‘Beyond Wings’ is a surprising second collection, as engaging as it is life affirming. Her love of language and the natural world shine through each journey she takes us on. Wherever she ends up next, I’ll be more than happy to tag along. Mark Connors is an award-winning writer from Leeds, UK. His poetry has appeared in various anthologies including Out of Ilkley (Ilkley Literature Festival, 2010), Still Life With Wine and Cheese (Stairwell Books, 2014), How Am I Doing For Time (2014) and The Garden (OWF Press, 2014), alongside poets such as Simon Armitage, Andrew Motion, Antony Dunn and Kate Fox. Mark has had over sixty poems published in magazines, including Envoi, Dream Catcher, Prole, Sarasvati, Dawntreader, The Alarmist and The Word.